Lia Halloran is an LA based painter and photographer. In her ongoing “Dark Skate” series, which she began in 2008, Lia photographs herself while skateboarding in the dark, creating self-portraits that reveal only the presence of movement and light. Through these long exposure photos she examines notions of performance, perception, and time. The scale of time is also an inherent theme in her current paintings, which are inspired by ginat crystal caves in Mexico. 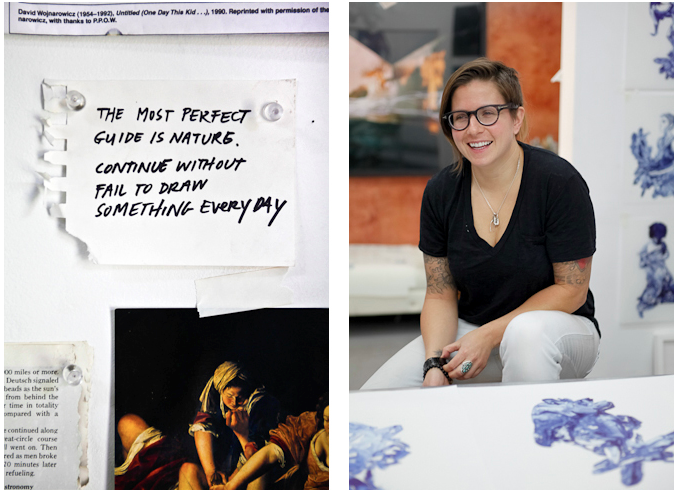 Her work is process oriented and questions driven – she begins with something she’s interested in and as she spends time learning about the subject matter, she explores the possibilities for what medium seems most fitting. Lia is also an Assistant Professor of Art at Chapman University.